Bshaw has always had a love and passion for dance. As a child growing up in Pasadena, CA he would mimic the styles of pop icons like Michael Jackson and MC Hammer. It wasn’t until he found out that his parents had met and danced on the world renowned television show Soul Train that his love of dance turned into a full blown blaze. It was a dream come true for Bshaw when he got the opportunity to perform with R&B sensation Chris Brown on the same stage his very own parents jammed on when they were kids. His most recent accomplishments in dance include various movies, television, and artists tours such as Beyoncé, Destiny’s Child, Usher, LXD and Chris Brown. With a ton of success in dancing, Bshaw thought it was time to take his knowledge of dance in the industry and push into the world of choreography. His expertise has afforded him the opportunity to help create the movement for such artist as Taylor Swift, Gloria Estefan and Chris Brown. Feature Film STEP UP 5: ALL IN and Disney Channel’s Original Movies LET IT SHINE and LEMONADE MOUTH, as well as Disney Channel’s SO RANDOM, SHAKE IT UP, AUSTIN AND ALLY and LIV AND MADDIE, and Lifetime’s BRING IT. 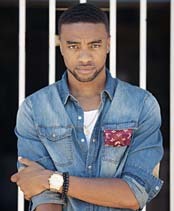 He has also worked as an Associate Choreographer for Chris Scott on FOX’s hit television series SO YOU THINK YOU CAN DANCE and was Supervising Choreographer on Chris Brown’s “Forever European Tour.” He has worked on every major award show on television and is proud to say that he helped create movement for clients ranging from film, television, and music. Austin and Ally, "I Got that Rock 'N' Roll"
Let It Shine, "Tonight's the Night"
Austin and Ally, "Finally Me Dance"
Liv and Maddie, "You, Me, and the Beat"